A Pakistani motorcyclist drives on China's newly built Silk Road in Haripur, Pakistan, on December 22, 2017. Photo by Aqeelk Ahmed/Associated Press. As China has promoted its Belt and Road Initiative—an ambitious plan to open new markets for China by building logistics and trade infrastructure from Asia to Europe and Africa—the Chinese government has drawn parallels with the fabled Silk Road, which operated from Africa to Europe and Asia from roughly 200 B.C. to A.D. 1400. But, as a matter of history, the “Silk Road” was nothing like the Belt and Road Initiative. In fact, in its time, there was no “Silk Road” at all. The Silk Road is actually a modern label in widespread use only since the late 20th century. It refers variously and imprecisely to long-distance trade and interactions across Afro-Eurasia. In reality, the Silk Road was never a formal network directed by one state power, as the Chinese propose with the Belt and Road. To the contrary, there were numerous mutable trading networks over this period. Some of these dealt in silk, raw and woven. Others did not. Some started in China or Rome, some in Central Asia, India, or Africa—and many other places. Journeys were by sea, by rivers, and by land—or by all three. Sometimes governments were involved in trade, sometimes private traders, and sometimes it was both. 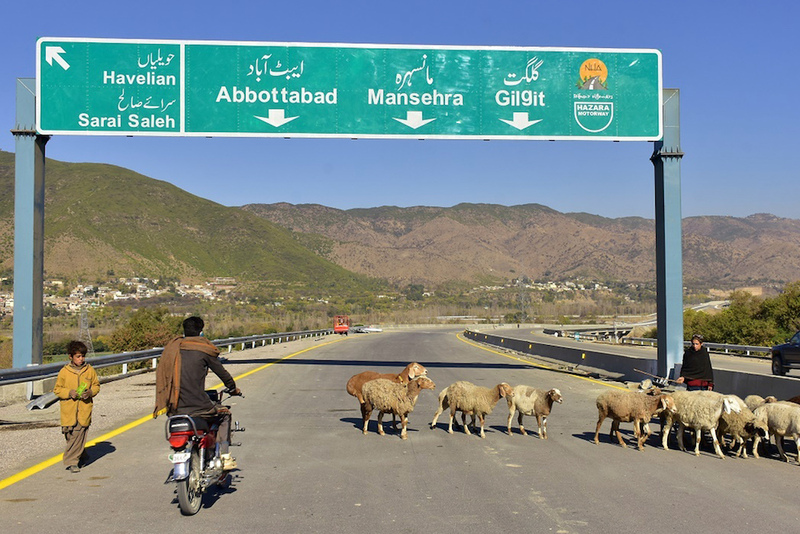 Despite these ambiguities, the Silk Road should not be dismissed as a concept. The Silk Road has acquired a familiarity that has real value, because it has brought regions that are rarely covered in modern historical writing to greater prominence and accessibility. As a result, the term’s growing popularity has encouraged a more global historical viewpoint. Central to the idea of the Silk Road is the interaction across boundaries, be they chronological, geographical, cultural, political, or imaginary. Those interactions, and the effect they had on individuals and their cultures, are the Silk Road’s real legacy, especially since the vast majority of objects of the Silk Road—everyday and luxury, traded or not—disappeared long ago. Food, wine, and medicines were consumed. Slaves, elephants, and horses died. Textiles, wood, and ivory decayed. Glass and pottery were broken. Only in rare cases did objects survive by design or accident, as in hoards of metal or glass, or in burials when objects were sufficiently valued to be interred with corpses. Nevertheless, the story of a single object can sometimes encapsulate the rich interactions of the Silk Road. Such is the case with a gilt-silver ewer found in the tomb of a sixth-century general and his wife in what is now northwestern China. The ewer was probably made at the heart of the Silk Road in Bactria (present-day northern Afghanistan), possibly when the region was under the rule of peoples who had migrated from the borders of China and the steppe, the Hephthalites. 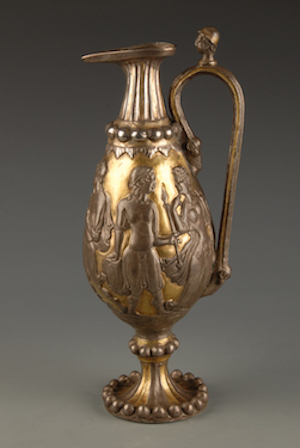 The ewer, 14.5 inches tall, shows its diverse background. Made with Sasanian Persian metalwork hammering techniques, it features both literary motifs from classical Greece far to the west as well as influences from India to the south. The biography of this ewer, therefore, covers the whole geographical length and breadth of the Silk Road. In one sense, the ewer spans 3,000 years. The scenes portrayed on it date to classical Greece, 1,500 years before its actual creation. Since its burial, it has spent another fifteen centuries to the east of its birthplace in northwestern China. Everything about this piece encapsulates Silk Road movement and interaction. Its form and materials, for example: metalware ewers spread from Rome through Sasanian Persia to central Asia, while in China the form is usually emulated in ceramics. Each place gave its own characteristics to the ewer’s basic form: the square handle of the Sasanians (the last Persian empire before the rise of Islam in the seventh century) or the camel’s head on this Bactrian piece. But perhaps its most fascinating features are the scenes from the Trojan War depicted around the ewer. The gilt-silver ewer found in the tomb of sixth-century general Li Xian in what is now northwestern China. Courtesy of the Guyuan Museum. Stories of the Trojan War probably traveled eastwards long before the Silk Road, with people, on objects, and possibly in texts. In the fourth century B.C. the Greek world and its influence expanded dramatically, owing to the campaigns of Alexander the Great (r. 336–323 B.C.). Alexander reached Bactria in 329 B.C., conquering it over the next two years. On his victory in 327 he took a bride, Roxane, who is usually described by historians as a Bactrian. Although Alexander’s rule did not last long—he died in Babylon four years later—the introduction of Greek language, administration, architecture, art, and culture eastwards into Central Asia was to have a significant influence, the so-called Hellenization of this region. And this influence might have spread further east: Some have attributed to it the appearance of life-size realistic statuary in China—exemplified by the terracotta warriors guarding the tomb of Qin Shihuangdi (r. 221–206 B.C.). While aspects of the Greek legacy were adopted into Roman culture, and while it is plausible to believe that depictions of the Trojan War were readily understood—and used—by many in the Roman Empire, it is more difficult to understand how such images were viewed by the peoples on what was once the fringes of Alexander’s empire in central Asia. The craftsmen of Hephthalite Bactria who produced this ewer were separated from the story and its birthplace by a thousand years in time and over three thousand miles in space. Even if the episodes depicted on this ewer can be traced back to Greek mythology, they might have been incorporated into some other more local narrative by this time and would have been described by their makers and owners in a way that we would not recognize. The ewer probably did not stay more than a few decades at most in Bactria before being taken east, to Guyuan in the northwest borders of China. Its new owner, Li Xian, was the son of immigrants. According to the biography inscribed on stone inside his tomb, his ancestors were from the steppe to the north and had moved to the border regions some generations before. By the time of Li Xian, they had taken a Chinese surname. We do not know whether they had retained their own language, or even what that language was. But this biography shows that they had not lost the knowledge of their northern steppe ancestry. In this way, the ewer demonstrates how culturally complex China has always been, with waves of invaders and migrants, especially from the porous and oft-challenged borders to the north and northwest. We should not assume that people living in China at that time were accustomed to being part of a unified empire or that everyone saw this as the norm or ideal. Central to the idea of the Silk Road is the interaction across boundaries, be they chronological, geographical, cultural, political, or imaginary. Those interactions, and the effect they had on individuals and their cultures, are the Silk Road’s real legacy. In the fourth and fifth centuries, northern China, including western areas into the trade routes and along the Hexi corridor, was under the rule of proto-Mongol Xianbei, who also came from the northern steppe. Around the time Li Xian was born, the Xianbei were ruling from Luoyang on the Yellow River, but their empire was in trouble. Rebellions in the north and battles between competing factions led to the empire’s division in 534. One of the reasons given for this was the growing divide between the regional rulers in the north, who still retained their contacts with the steppe, and what these rulers saw as the increasingly distant and sinified Xianbei elite in the Luoyang capital. As a military commander posted to frontier stations, Li Xian would have traveled considerably, and many of his travels would have taken him along the trade routes of the Silk Road as well as to the capital to give reports and receive orders. In the year 525, a Hephthalite envoy passed through Guyuan en route to Luoyang; he was accompanied by a lion, one of his diplomatic gifts. This was not a unique gift: Lions were presented to the Chinese court by Tocharians in the seventh and eighth centuries, and one sent from Samarkand in 635 received an imperially commissioned rhapsody in its honor. Li Xian would have been only a young man in 525, but given the status of his family, it would be expected that they would have entertained the envoy during his stay and possibly they received the ewer as a gift. How did Li Xian see and use the ewer? Was it an exotic piece brought out for formal banquets, filled with local grape wine for his guests and intended to reflect his status and cosmopolitanism? Or was it used at less formal occasions—or not used at all? For all we know, he might have acquired it only shortly before his death and never put it to use. These are tantalizing questions but ones on which we can only speculate. The same goes for what Li Xian made of the design on the ewer. Did he know anything of the Trojan War story, even if it had become assimilated into local myths? Or was the piece interpreted as depicting another local story? Or not interpreted at all, just seen as an attractive or an exotic design? Not all people ask questions about the world around them and the objects they encounter. Indeed, perhaps this ewer held more interest and value to his wife: theirs was a joint tomb. But this object and its journey reflects a time of cultural movement and encounters—the story of the Silk Road—which left an imprint on pre-modern society across Afro-Eurasia and still resonates today. Susan Whitfield was curator of the Central Asian collection of manuscripts at the British Library for 25 years. Her latest book on the Silk Road is Silk, Slaves and Stupas: Material Culture of the Silk Road.